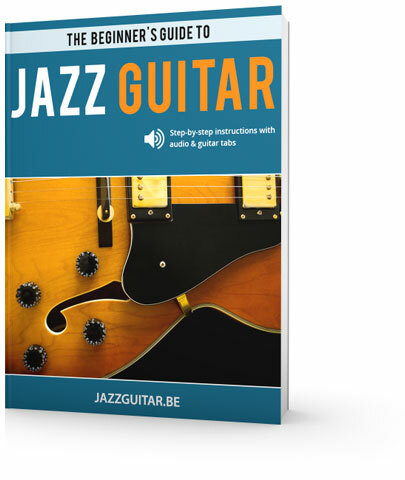 Download Your Free eBook and Start Playing Jazz Guitar Today! Welcome to Jazz Guitar Online! I'm Dirk Laukens, jazz guitar player, teacher and webmaster of this jazz guitar website that started in 2003. Learning jazz guitar and improvisation isn't always easy, but that doesn't mean the learning process has to be complicated. 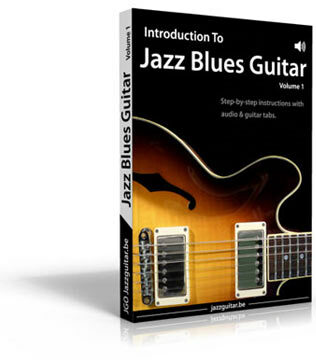 Our free jazz guitar lessons and eBooks are designed to make learning jazz guitar easy and fun. Our jazz guitar lessons cover a great variety of topics, for beginners as well as for the guitar pro, and will get you playing jazz guitar in no time! Jazz Guitar Chords - jazz guitar chords sound great and are a lot of fun to play. This tutorial will teach you 17 essential jazz guitar chords that are needed to play jazz standards. Jazz Guitar Arpeggios - arpeggios are the best tool to play over chord progressions. In this beginner's guide you will learn what arpeggios are and how you can use them to outline the harmony of a jazz standard in your guitar solos. 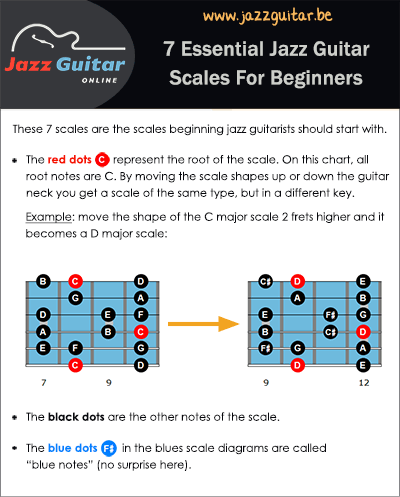 Jazz Guitar Scales - scales are another essential tool for jazz guitar improvisation. This lesson teaches you 7 essential jazz guitar scales that allow you to play over almost any jazz song. Jazz Guitar Licks - learning licks is a great way to get new sounds and ideas in your jazz solos. In this lesson you will learn 20 classic bebop licks. Autumn Leaves - Autumn Leaves is a great jazz song for beginners. In this lesson you will learn how to play the melody of Autumn Leaves and how to improvise over the tune's chord changes. There are a lot of guitar chords, and you need to know a lot of them to play jazz. It's not always easy though to know where to start learning jazz chords. Besides learning chords, you also need to get the most common chord progressions under your fingers. In our jazz guitar chords section, you will learn all the basic guitar chords and chord progressions you need to play jazz. For every chord type there is a printable guitar chord chart and chord exercises to get you going. Transcribing and learning licks from your favorite guitar players is a great way to expand your jazz vocabulary. By studying jazz licks and the concepts behind the licks, you absorb new sounds and ideas that will enrich your jazz guitar playing. Our jazz guitar licks section is a collection of guitar riffs, licks and patterns in the style of jazz guitar players such as Pat Metheny, George Benson, Django Reinhardt, Joe Pass, Mike Stern, John Scofield, Charlie Christian, Wes Montgomery, but also jazz greats such as Miles Davis, Charlie Parker, Duke Ellington, and John Coltrane. 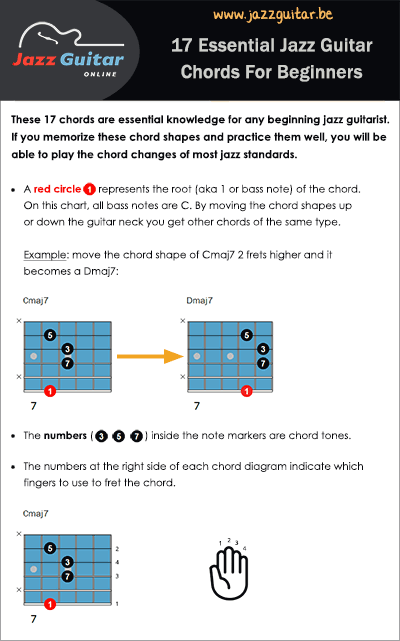 Jazz guitar scales are essential material when learning how to play jazz guitar. Our lessons cover all scales you need to know to get you started improvising over jazz standards, such as the major scale, the 7 guitar modes, the diminished scale, the altered scale, and many more. When learning jazz guitar, one of the best ways to improve quickly is by playing jazz standards. By playing songs, you bring all the technical material such as scales and arpeggios together in a musical situation. 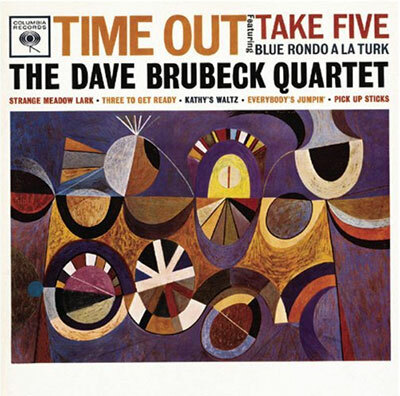 Some easy songs to begin with are Autumn Leaves and Blue Bossa. Other important standards include the blues, the minor blues, Summertime, Billie's Bounce, Watermelon Man and All Blues. 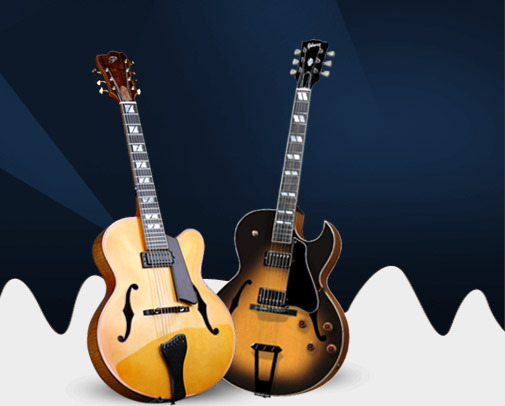 In the guitar gear section you will learn how to get a jazz guitar sound and find the gear you need to play jazz. 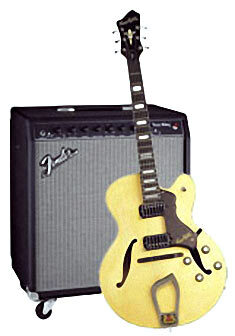 Choosing a guitar and amp for jazz can be a bit confusing since there is so much choice. The articles below will help you choose the best jazz guitar and amp. Learn to play jazz blues in the style of your favorite jazz guitarists with our Intro to Jazz Blues Guitar course. 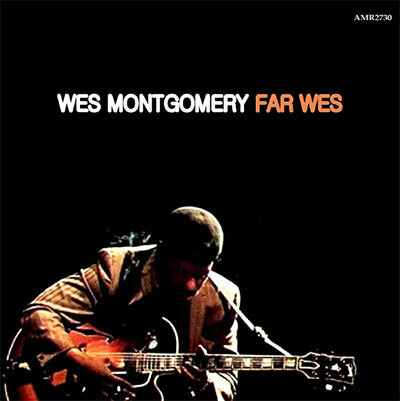 Full of fun and informative lessons with audio and tab/notation, this course is designed to get you sounding like Wes Montgomery, Kenny Burrell, Joe Pass and other great jazz blues guitarists. Over 115 audio examples to make learning fun and easy. Using arpeggios is the most direct way to get a jazz sound in your solos. 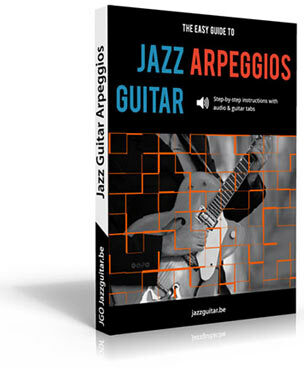 The Easy Guide to Jazz Guitar Arpeggios is a step-by-step approach that teaches you the fingerings, knowledge, exercises, and common phrases, you need to confidently solo over any set of jazz chord changes. Must know arpeggio shapes for maj7, 7, m7, m7b5, dim7, and mMaj7. How to use arpeggios to solo over chords and common chord progressions. Exercises to build your knowledge of arpeggios in a technical and improvisational context.